The holiday season is officially here! 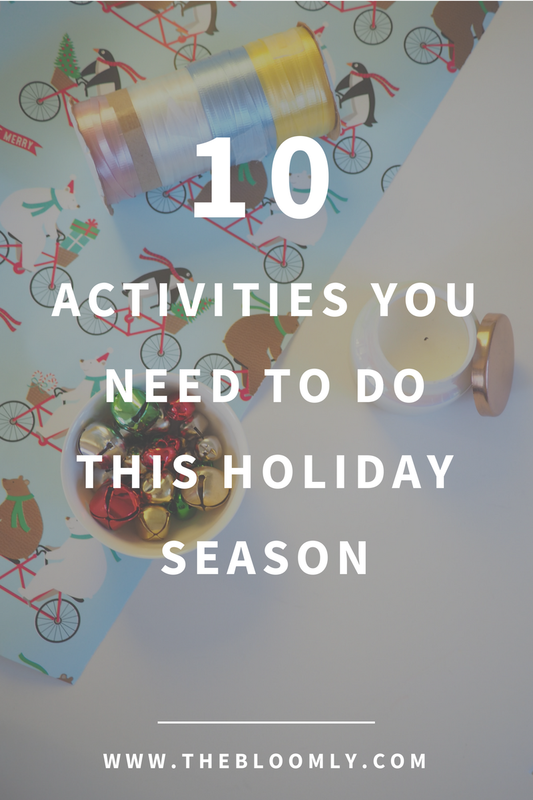 And what better way to get into the holiday cheer than with some fun holiday-themed activities? Whether it's something planned like secret Santa where you can carefully cultivate the PERFECT gift for a friend or a White Elephant gift exchange where you can be lazy and just get fun random gifts, it's always nice to do a little gift giving with your friends! Christmas is a holiday that is celebrated all over the world, so why not explore how others celebrate the same holiday? Here's a how Christmas food is in some other countries and I challenge you to try cooking one yourself. It might be a mess, but it also might be incredibly delicious. Additionally, I challenge you to research the cultural context of the dish that you end up making. It's so interesting to see the meaning behind some of the food that we eat and to understand its significance to a culture. There are a million holiday playlists out there, but you can still make your own holiday playlist that is specific to you. Whether you love the classics or like more modern holiday music, everyone has their own tastes and preferences regarding it and you have the opportunity to craft your own. Mexican Christmas festivities begin with Posadas, which are nine parties occuring daily from the 16th until the 24th of December. During the party, they celebrate by breaking a star-shaped piñata. Although it was used in a religious context then, it's still fun to hit a piñata and eat a little candy, especially since it has largely lost its religious association and moved towards being symbolic of celebrations and birthdays. Additionally, if you're going to do so, I highly encourage you to consider the cultural and historical meaning of the holiday piñata, since it's something that we usually don't think about. Now that you've recognized the meaning of the piñata to Posadas, if you want to try out making piñatas, it can be a fun activity and also provide you with the opportunity to do #4 on this list. Here's a link to a Christmas tree piñata tutorial which is more taken out of the cultural context and adapted into a more American culture, but if you want to be more true to the historical meaning of Posadas, make a 7-point star piñata (that represents the 7 deadly sins). Here's a closer look on how they're made. Whether to you, the local museum is the Met or it's just a tiny little building with a few pieces inside, it's nice to appreciate the local attractions. Additionally, a lot of them have holiday decorations and/or holiday events that you should take advantage of. Most of the time, I definitely don't appreciate the museums and local attractions that are around me, but I think that the holidays is a great time to visit them, especially with the added bonus of special events. Whenever I go grocery shopping, I always see a mountain of various holiday chocolates that are in fancy shapes or packaged nicely. However, you can make your own in those fancy shapes and packaging as a fun activity. Here's a list from Martha Stewart on homemade holiday candy to make that will be interesting to make and also great for giving out as gifts for that added personalized touch that grocery store chocolate just don't have. I love making a nice gingerbread house, but I recently stumbled across the Starbucks gingerbread cafe and although it's a little extra, I'm kind of into it. If you didn't know about them, Starbucks is selling gingerbread house kits, but what's in the kit allows you to craft a gingerbread Starbucks cafe instead of a traditional house. I think it's a cute and creative idea on their part, but if you're not into Starbucks, I think that the idea of straying from the traditional gingerbread house to make something new and exciting can be fun. Related: Feel so stressed about finals that you feel like you're missing the holiday spirit? Here's how to celebrate the holidays while going through finals! Want to make the typical Christmas cookie baking more exciting? Try out a baking show style challenge like where you set out a few holiday themed ingredients (ones ideal for baking and some not so ideal) such as peppermint, eggnog, Christmas ham, figgy pudding, and cinnamon, and challenge everyone to make a dessert combining a few of those ingredients. This is completely inspired by Cupcake Wars' round one where contestants have to put together an unusual mix of foods into a good cupcake, which I think seems super challenging but interesting! Whether you choose to make holiday care packages for your friends, family, or even to give to charitable organizations, care packages are fun to make and also a great way to show your appreciation during this holiday season. For friends and/or family that you might not get to see during the holidays, it's especially nice to send them a little care package personalized for them to let them know that you care. I'm pretty sure that I've mentioned this before, but making handmade holiday cards is one of my all time favorite holiday activities (next to holiday baking, of course). Making a handmade holiday card is one of the best ways to show your loved ones how much you care, considering all the hard work that goes into card making. Aren't artistic? No worries! I did a holiday DIY post a long time ago that included a super easy holiday card to make in which all you need are some sticks from outside, scissors, a hot glue gun, a star sticker, and a blank card to make a gorgeous Christmas tree card. Psst! 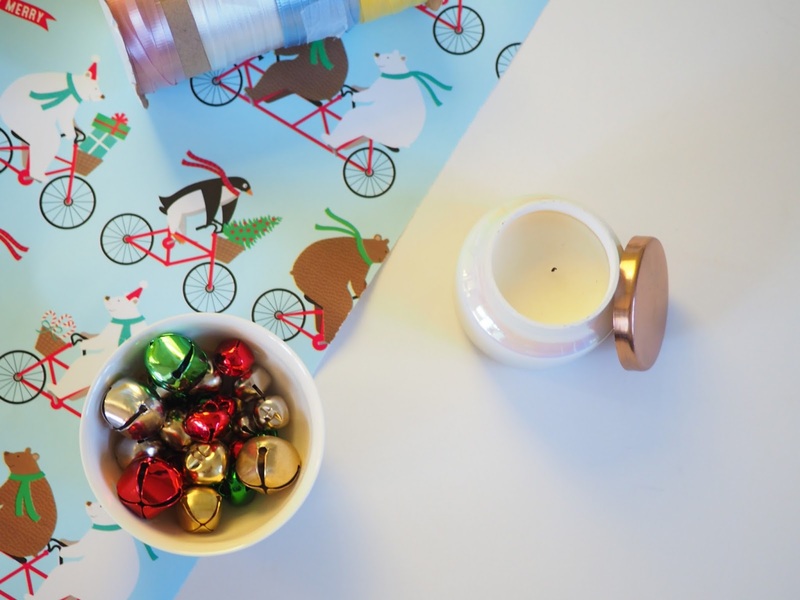 Want printable handmade holiday cards? Subscribe to the email list for two handmade holiday cards that your friends and family will love!